Quite a few websites boast that they have the 'largest range of books available on the internet'. And then go on to warn that there may be delays of up to 12 weeks between ordering and receiving a book. I run my site differently - I hand pick every book I sell and they are all genuinely in stock unless noted otherwise beside the individual title. If a book is out of stock, it will usually be available again within a few days. There are currently over 2000 titles listed and I'm adding more titles regularly. If you are searching for a particular title, please contact me - I may have it sitting here awaiting listing, or I may be able to locate it for you. I started off selling a few of my own books online 7 years ago, and what began as an interesting pastime has developed into a more-than-full-time job. At the end of 2006 I quit my night-shift nursing job to concentrate on online retailing, setting up this website in mid-2007. I do still sell occasionally on online auction sites, but now spend most of my time building up my range of books on my own website and maintaining a high level of customer service for all my customers. Hey look, I'm on the internet! I'm featured in an article about Online Selling in the June-July 2010 issue of Australia Post's Australia Today magazine - click here to read the article as a PDF file. But that's probably enough from me about me. Here are some comments from a few of my happy customers. I picked up the books at the Post office today. I can't wait to see the looks of surprise on the faces of my twin girls!! The Rainbow Magic books are so much nicer than the ones that are sold in the US. Also, thanks so much for the extra book!! I really appreciate your kindness. I am sure you will be hearing from me again to order more books!! Just a quick note to let you know that I have received my books, thanks. I would like to say how delighted I am with your careful packaging ensuring the parcel arrived in pristine condition. Maggie's book is wonderful. I am at work and find myself delving into it when I should be working!! 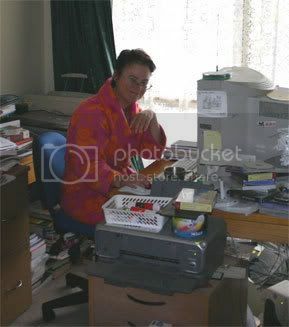 If you're still reading, here's another photo of me, hard at work! Yes, that's a pink dressing gown I'm wearing.